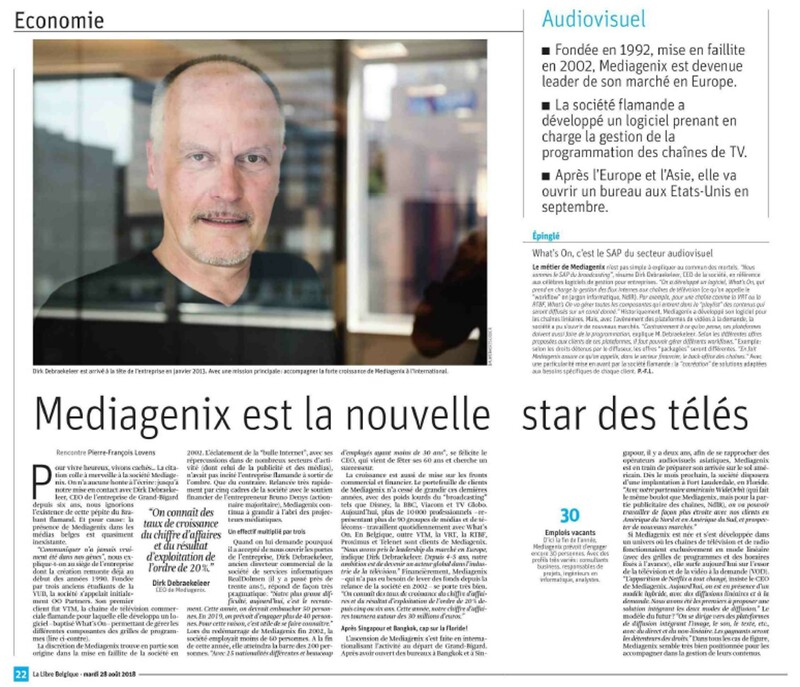 MEDIAGENIX | Broadcast Management System / News / Who is MEDIAGENIX, the Belgian star who seduced Disney and the BBC ? Far from the spotlight of the consumer audience, MEDIAGENIX steadily grew into the hidden gem of media companies worldwide and the market leader in Europe with Broadcast Management System WHATS’ON—”the SAP system for the audiovisual industry”. Headquartered in Groot-Bijgaarden (Brussels) MEDIAGENIX has offices in Bangkok and Singapore for the APAC market, and as from September also in Fort Lauderdale for the U.S. and Latin America. With a yearly growth in turnover and operating profit in excess of 20 % and a head count growing from less than 60 in 2002 to a planned 200 by the end of 2018 (30 yet to be recruited this year), MEDIAGENIX keeps ensuring an international inflow of talent, mainly software engineers, functional analysts, project managers and business consultants. The team currently consists of 25 different nationalities, most are younger than 30. Their ambition is to be a world player.